Keeping true to our “outside in” approach to pest elimination we start by installing our Pro-Guard Rodent Program to include exterior rodent bait stations that are anchored to the ground, locked shut, and labeled with a service card inside, making these stations tamper proof and child safe, and pet-friendly. These are usually located on each side of exterior doors as well as around the dumpster area if you are a commercial property. 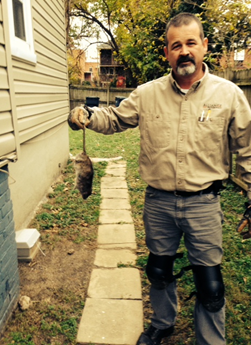 This program allows us to take care of any rodent population before they can enter your home or facility. Commercial food and beverage account? We also offer barcode recording of service and issues found at each bait station to keep you in compliance with regulatory agencies. In addition, we inspect the perimeter of the property for rodent entry areas such as faulty door sweeps, openings around pipe chases as well as entry areas on the roof and around eaves. We will note on the service report of any conditions conducive to a rodent problem including vegetation close to the structure, sanitation issues, etc. We will also install interior rodent traps. These devices are also self-contained and tamper proof. They are also labeled and we can add barcoding as well as our Food Processing customers. All conditions found inside of the structure as well as outside the structure will be noted in the service reports. Rodent Exclusion services are also offered. If you need door sweeps, gaps around entering pipes, holes in walls, we would be glad to take care of these problems for you!